This project is aimed at controlling the cold collision between an ultracold Rb atom and a trapped Ba+ ion. During the collision a laser excites the Rb atom to a Rydberg Stark level which is strongly repelled from the ion. In this way the ion is effectively surrounded by a hard potential wall that the atom cannot cross. Once the atom leaves the interaction area, it is de-excited back in an adiabatic way to its original level. By controlling the laser power and the laser frequency, as well as by addressing different Rydberg states, the properties of this ‘shielding’ can be widely tuned. We will use this control to suppress atom-ion chemical reactions and to tune the elastic cross sections of atom-ion collisions. Furthermore, we plan to demonstrate novel optical Feshbach resonances and to produce novel Rydberg molecular bound states. Figure 1: Scheme of shielding using a Rydberg level. 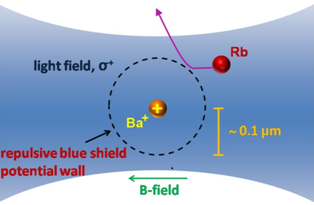 A high intensity laser beam with σ+ polarization excites a colliding Rb atom to a Rydberg level that is repelled by the electrical field of the Ba+ ion. The excitation takes place at a distance of about 0.1 μm from the ion.